For the little vegans birthday we were baking two cakes and she got to choose one of them. 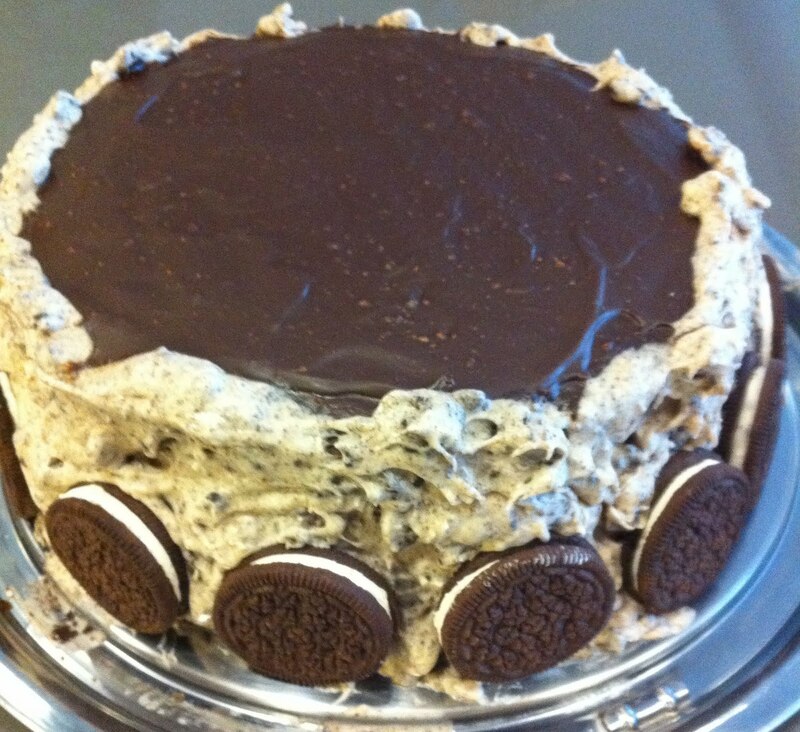 She challenged me to make a Cookies and Cream cake. Why a challenge? Because I am probably one of the few people in America that doesn’t like sandwich cookies so I was not feeling the force. The cake was definitely a hit at the party being devoured by kids and adults. The directions are for how I decorated the cake but feel free to have fun. The icing was good without the white chocolate, I just love white chocolate and use it when ever I can find an excuse. In a large bowl mix flour, salt baking soda, baking powder, and egg replacer. In a separate bowl mix sugar, oil, applesauce, milk and melted chocolate. Slowly mix sugar mixture into flour mixture and stir until well blended. Pour batter evenly into the three pans. Tap bottom of pans to get air bubbles to the top. Bake for 20 – 25 minutes. Cake will pull away from side when done. When done let sit for approximately 5 minutes or until cool enough to touch pans with bare hands. Flip onto cooling rack. Let cool completely before putting cake together. Do not start the filling for the layers until you are ready to decorate the cake because it will harden. The icing may be made ahead of time. Over low heat melt chocolate with almond milk and butter substitute. once chocolate is melted slowley stir in powder sugar. Place first layer of cake on serving platter/plate. Use 1/3 of filling covering first layer of cake. Keep filling 1/4″ away from cakes edge. Place second layer of cake on top and do the same thing. Put the last layer on top and pour remaining chocolate over the top. In mixer blend cream cheese and butter substitute until smooth. Slowly blend in powder sugar making sure there are no clumps. Melt white chocolate with almond milk over low heat. Mix melted white chocolate into frosting. Stir in crumbled cookies. Cover sides of cake and then decorate with whole cookies. Hi, we made the cake this weekend. So good, but not enough people to eat it. It’s Monday, and we’ve only been able to eat 1/10 the cake. Can I free it, or will that ruin it? I meant “can I FREEZE it”. Sorry! I have never frozen this particular cake but have frozen others and the defrost great. I recommend doing it in slices though. Glad you enjoyed it! !